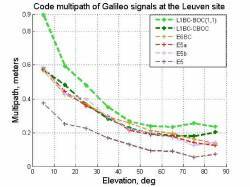 Standard deviation of code multipath for Galileo signals transmitted by GIOVE-B. The two thicker lines show the L1BC modulations: BOC(1,1), light green, and CBOC (dark green). Initial results from observations of the Galileo GIOVE-B satellite conducted by researchers at the European Space Agency (ESA) and Septentrio Satellite Navigation indicate that the multiplex binary offset carrier (MBOC) modulation outperforms the BOC(1,1) modulation on the L1 (data + pilot channels) frequency in mitigating the effects of multipath or reflected signals. Analysis of data gather in May at the GNSS receiver manufacturer’s facilities in Leuven, Belgium, show a 20–25 percent advantage for MBOC in multipath mitigation, with the largest improvement occurring in signals from lower-elevation satellites. The results are in line with the predicted benefits for MBOC versus BOC(1,1). According to the researchers, this improvement is mainly due to the reduction of the high-frequency part of the receiver correlation error (characteristic time less than 10 seconds), which consists of tracking noise and long-range multipath. MBOC is the common waveform agreed upon by the United States and the European Union for use on the Galileo Open Service signal and the future GPS L1 civil signal (L1C), which will be broadcast on the Block III satellites due to begin launching in 2014. MBOC is implemented either as — in the case of Galileo — a composite BOC or CBOC, with a superposition of BOC(1,1) and BOC(6,1), or as TMBOC, a time-division-multiplex of BOC(1,1) and BOC(6,1), as is planned for the GPS L1C signal. The observations were collected using a Septentrio GSTB‐V2 Experimental Test Receiver (GETR) developed under contract for the Galileo program. The GETR can be configured to track the CBOC signal in both modes simultaneously on two different channels in order to make a direct simultaneous comparison of BOC(1,1) and CBOC. An article describing the tests and results in detail will appear in the September/October issue of Inside GNSS magazine.